By keeping track with the market development, we are offering optimum quality 3 Way Pneumatic Cylinder Operated Control Valve. Our provided valve is manufactured by our professionals using optimum quality material and advanced technology at our well maintained manufacturing unit. 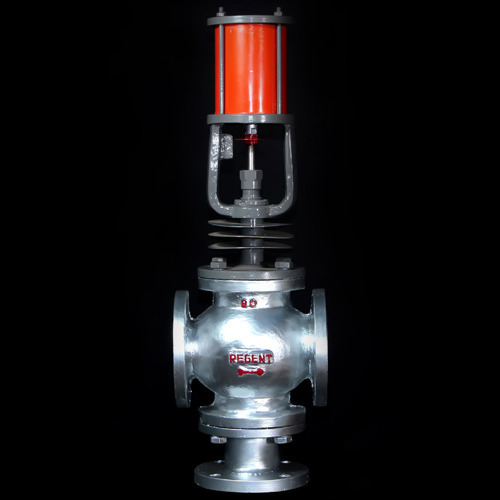 Our offered valve is used in controlling the flow of liquids and gases optimally. This valve is available in number of specifications to fulfill users' diverse requirements of their application. Established in the year 1990, we “Regent Industrial Products”(ISO 9001:2008 company) , are engaged in manufacturing and trading the finest quality range Industrial Valves, Valve Accessories, Solenoid Valve, Butterfly Valve, Cylinder Operated Control Valve,Diaphragm Type Control Valve, Motrorised Ball Valve, Motorised Control Valve, Ball Valve etc. . Our high-end infrastructure facility developed at Ahmadabad (Gujarat, India) assist us manufacture these products in compliance with defined industry standards. In order to manufacture these products with high level of accuracy and in an efficient manner, we have divided our infrastructure into several units including production, quality testing, research & development and warehousing & packaging. These units are installed with several kinds of ultra-modern manufacturing, testing and other machines and technologies. Backed by our state-of-the-art infrastructure facility, we have been able to meet the specific requirements of clients by manufacturing products according to the information provided by them.